Discover Hollywood legend Danny Elfman’s exhilarating first concerto. 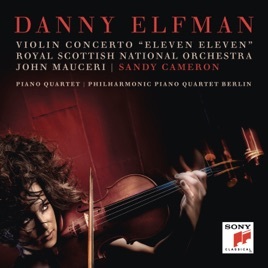 Danny Elfman Violin Concerto "Eleven Eleven"
Wonderful and ethereal. Elfman is a unique musician/composer who's refusal to toe the conventional line has stood the test of time, and it really shows here. Sandy Cameron is, as usual, exceptional and a great match for Mr. Elfman's composing style. Anybody who is a fan of his film scoring and his music in general should consider adding this to their collection.